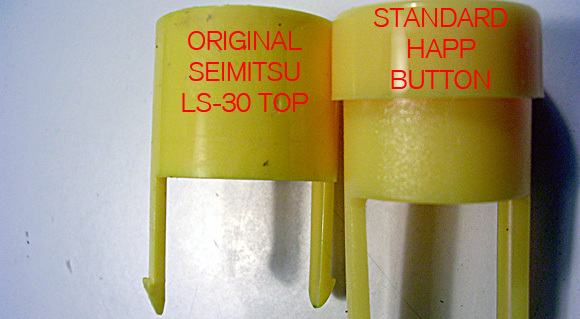 Like the title says, this is the thread for developing and testing a printable LS-30 handle for the J-Stik/ServoStik Ikari 12-way Rotary Upgrade announced here. Anyone who wants to join in, grab a copy of OpenSCAD and bookmark the OpenSCAD cheatsheet to help you with the commands and syntax. - Removable top like the original handle. - Two free-floating eject pins instead of the long legs on the original top. - M6 locknut and maybe a star washer or two to secure the handle to the shaft. - No shaft mods, just print and assemble. Any more features you'd like to see added or changed? Mounting plate to shaft shoulder distance = 46mm. Next step: A diagram to work out the vertical positioning of the handle on the shaft. Just ordered the rotary kit. Looking forward to your advice and observations, Deven. First thing to do is solve for Shaft Height with a typical 3/4" wood panel (19.05mm) and a typical metal panel (1.6 mm) since most panels will fall within that range. The original handle BodyHeight is 35.6mm, so ShaftHeight + ThreadedHeight + TopThickness (the removable cover) have to fit into that vertical space. TopThickness <= 14.85mm -- Lots of wiggle room there. TopThickness <= -2.6mm -- Threads are higher than the handle body, needs some 5mm spacers (or larger) between the stick and panel. TopThickness <= 2.4mm -- Just enough wiggle room for a 2mm top. Looks like the handle will work with 6.6mm (metal panel + 5mm spacers) - 19.05mm (3/4" wood) panels and leaves room for a 2mm recess for the top cover. Next step: Define variable names and trim/organize the code. EDIT: Fixed several errors in the metal panel calculations. Test print updated with new variables and comments. // This test print allows you to verify the correct variable values for your specific hardware and your slicer software before you render/export/print the whole handle. // This part is oriented upside-down compared to the handle so print supports are not needed. First pass on the handle updated with new variables and comments. // Hole for remvable top. 2mm deep. // Number of fragments (polygon sides) used to render a full circle. // 6 will render a circular hole as a hexagon, 8 will render a circular hole as an octagon. // Lower the number for faster rendering, raise the number for smoother rendering. - Print a handle and two pins to confirm two tiny changes. - Review documentation for errors and typos. I'd greatly appreciate if someone (Deven? ) with a 3d printer and the Ultimarc Upgrade Kit or other Ultimarc 9mm shaft stick can do a test print to check if ShaftDiameter = 9.35 is good default value for a 9mm shaft stick. -- ShaftDiameter is set on line 21 of LS30_Test_Print_Ultimarc.scad and line 45 of LS30_Handle_Ultimarc.scad. -- ShaftDiameter = 10.35 works for the 10mm shaft on a Zippyy. // Hole for removable top. // This variable is not used to generate the part, but is used to calculate DomeSphereRadius. // Sphere radius that will generate the desired dome. // Enter the "Width of Arc" (DomeDiameter) and "Height of Arc" (DomeHeight) into the calculator at http://handymath.com/cgi-bin/arc18mm2.cgi?submit=Entry The resulting "Radius of Arc" = DomeSphereRadius. // The "SNK_Logo.dxf" file needs to be in the same directory as this SCAD file. EDIT: Updated LS30_Eject_Pin_Ultimarc.scad to generate two pins instead of just one. Lots of good work here! I have the upgrade and servo stick in hand. Need to find some sample mounting panels and will try your test print. 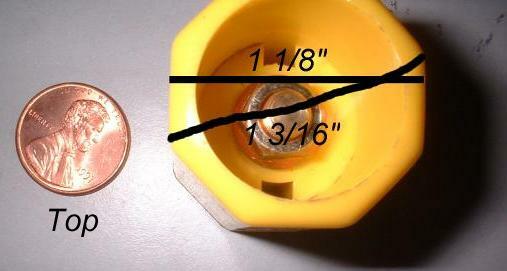 It's just a small cylinder (15.35mm diameter x 11 mm high) that lets you test different values for ShaftDiameter (yellow part) and ThreadedDiameter (red part) without printing a whole handle. Did a super rough print. The inner diameter has enough play that you can wiggle it back and forth. Im thinking bringing it down to maybe 9.15-9.20 would be enough so it doesn't have much play but still slides on and off. I printed it at .2 mm layer height, the top part gets a little rough. Im not sure if adding the cap would help smooth it out. Might try doing .1mm layer height to smooth it out but adds another hour to the print. Also the bottom curve had to much overhang, printing at .1mm might fix that. I need to get some hardware from the store, printing another one out with other settings. Need more top layers, 2 was not enough. Yeah, there are lots of little tweaks to the variables that will dial-in these prints for your slicer/firmware-settings/printer. A firmware setting that I changed on my printer possibly causes it to over-extrude by about 4-6%. Once you get a good clean print for the handle, it's easy to adjust variables and reprint the smaller pin and handle top prints to fit the handle. You can probably reduce the "WiggleRoom" variables in the eject pin and handle top OpenSCAD files. The overhang on the bottom prints OK here. I've been working on the design and here's a change that will keep the handle from turning separately from the shaft when the friction between the shaft, handle, and nut isn't high enough. Instead of using a cylindrical cavity for a socket or nut-driver, use a hexagonal cavity so the handle is the nut-driver for tightening the locknut. A locknut won't easily spin off the threads and with this design change the handle can't turn without also turning the locknut and shaft. 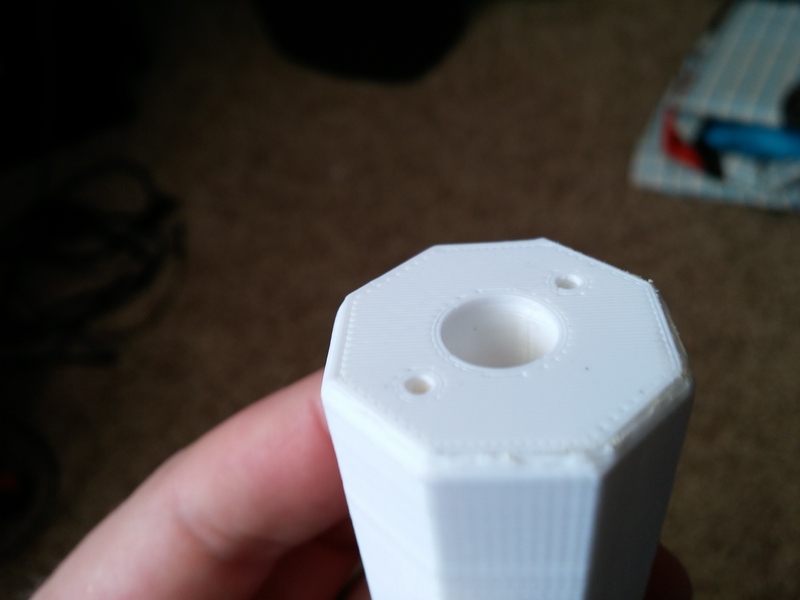 Here's a test print to verify that the hexagonal cavity is a snug fit for the locknut . . .
. . . and here's the updated handle code. There are still some details to confirm, but things appear to be on the right track. Looks great. Is there a possibility that one of you guys will run off a batch and offer them for sale once this is dialed in? I do not plan to sell them. Haven't discussed it with him yet, but if Andy is interested he can either print them himself or sub-contract to a 3rd party. If Andy is not interested, another possible option is enabling one or more apps on Thingiverse so a 3rd party can print them. Has anyone used the apps on Thingiverse to print something? If you have, which app(s) would you recommend? I have a 3D Hubs account but have yet to get any jobs to print. I am getting a SLA or DLP printer soon and will be curious to see how well these turn out. The hexagon cavity design works great with an M6-1.0 (coarse thread) nylon-insert locknut like this one. As expected, the handle works perfectly as a nutdriver when you use cardboard padded vise-grips to keep the shaft from turning during installation/removal of the handle and locknut. Other than the few remaining adjusments listed at the end of this post, the code below should be solid. 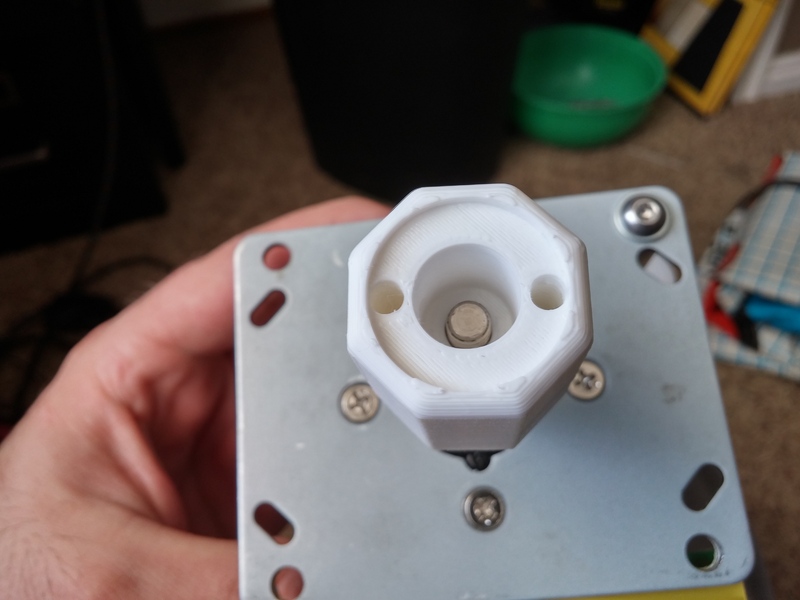 If anyone has a 3d printer and the Ultimarc 12-way rotary kit, please test-print a copy to verify. - Set the ShaftHeight variable (line 40) to 30.4mm minus your panel thickness. -- Are these the most commonly available metric lumber sizes? Any other sizes? I'm about to place an Ultimarc order for a pair of J-Stiks and the 12-way Rotary kits for J-Stik, so I am also very interested in either purchasing a set of finished handles from a 3rd party, or providing specs to a company that can print the parts out. I've been lurking back and forth in this thread for a little while, and am looking forward to the finished product. Is there an update to this project? There isn't much left to do, but I've been a bit sidetracked between projects around the house, helping Saint with the new server to-do list and dealing with a relatively high-volume three-week-long spam-account-creation attack. I hope to find better default values for the TopDiameter, TopWiggleRoom, and TopTaper variables in the next week or two. Once those are dialed-in, the rest should fall into place pretty quickly. Thank you for the prompt reply Scott, and I really appreciate that you're still finding time to devote to this project. We all look forward to the final solution. My Ultimarc order should be in next week, so let me know if there's anything I can do to help.